My rating: 8.5/10. Excellent watch. Value for money, durable design. Hello, today I’m doing a G-Shock GA-400-1BER review. Well, I did say we would be looking at quite a few G-Shock watches this week, they’re just so damn good. 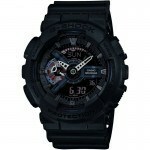 This is another affordable G-Shock watch that’s perfect for those seeking a highly durable watch. I hope you enjoy this G-Shock GA-400-1BER review below. 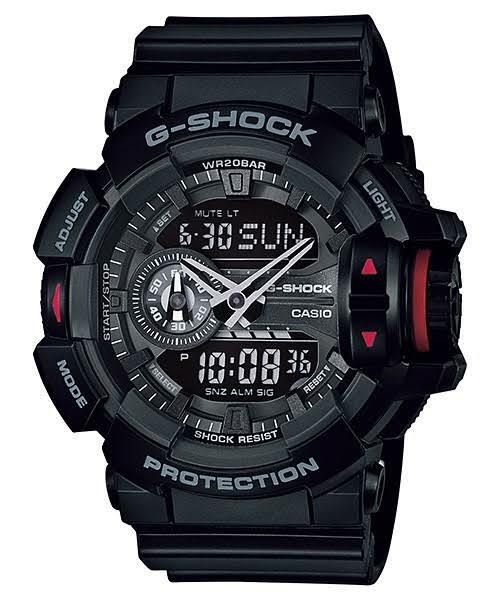 As you’d expect from a G-Shock watch we have this really bold oversized design that really stands out on your wrist. The watch has a dual analogue/digital display that a lot of people are really fond of. 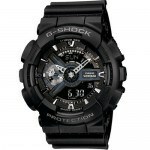 This is another highly functional G-Shock watch that has that typical high level of durability. The dial design is quite interesting on this model, we have these hands with this slightly hollow effect mixed in with two separate digital displays, this allows you to view a huge amount of information at the same time. There’s a mineral style crystal glass protecting the dial of the watch. Mineral glass is specially hardened to offer a good level of scratch resistant. It’s ideal for shatter resistance as well, which is a key thing G-Shock wanted to focus on. 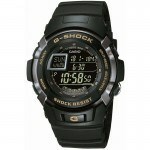 Casio’s G-Shock range are known for their military-esque style with these bold oversized designs. Built to offer a high level of shock resistance, the stainless steel casing is covered in this thick protective resin that gives you this extra tough finish. Taking a closer look at the size specifications of the watch now. The casing diameter is an impressive 52mm which makes this a pretty huge watch. The thickness is 19mm that makes it a very thick timepiece. A lot of people really love these thick oversized designs of G-Shock watches, however, people with smaller wrists may not find them that suitable. The watch is full of useful functions, it has a stopwatch, countdown timer, day & date display, multi-time zone, backlight, and an alarm. As you can see many of these can come in quite handy, it’s worth noting that people have stated the backlight isn’t brilliant, however. At the heart of the watch, we have a Japanese made quartz movement. These are affordable, reliable, and accurate. Perfect for an affordable quality timepiece. To go with the rest of this oversized design we have a fairly wide 26mm resin strap. The watch fastens with a sturdy double prong buckle clasp. To top the watch off it has a fantastic 200m water resistance rating. This makes the watch suitable for professional marine activity, serious surface water sports and skin diving. Band Resin strap, standard length, 26mm width, double prong buckle style clasp. Case Stainless steel casing with resin surround, sizing diameter: 52mm and thickness: 19mm. Dial Analogue/digital display. The window lens is made of mineral glass, this is specially hardened to be resistant to scratches and knocks. Mineral glass offers a good level of scratch resistance. The G-Shock GA-400-1BER is another G-Shock watch that’s suited for those with their active outdoor lifestyles or a keen interest in extreme sports. The G-Shock range continues to remain one of Casio’s best-selling collections, and for very good reason, they offer a high-quality durable watch at an affordable price. Overall this is another brilliant watch from G-Shock. Hope you enjoyed this G-Shock GA-400-1BER review. Find more watch reviews below.